Dan Sarginson is winning his race to be fit for the World Club Challenge. The centre was withdrawn at half-time in Friday’s 34-16 win against Leeds after rolling his ankle. Adrian Lam admitted afterwards he was a doubt for Sunday’s showdown with the Sydney Roosters. But Sarginson is recovering well and Lam is hoping he will be fit to play. Chris Hankinson, recruited from Swinton midway through last year, has been put on stand-by. Lam said: “Dan has pulled up pretty good which is a positive sign. “We’ll give him as late as possible. We’ve brought in Chris Hankinson to cover for him but I think Sarginson will be okay.” Hankinson only played two matches last season before being sidelined by a detached retina. 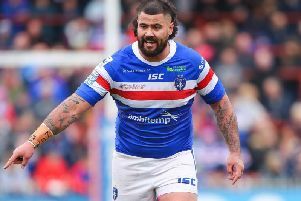 He turned out for former club Swinton on dual-registration last Sunday. Lam has no other fresh injury worries or suspension concerns, Sean O’Loughlin was charged with making dangerous contact, but does not face a ban, while he has welcomed a player back to his senior squad. Jarrod Sammut was ruled out of the first two matches of the season after being banned for making contact with the referee during a friendly at Salford. The ex-London Broncos halfback was signed in the winter and is yet to play a competitive match. Lam suggested he would stick with the 17 players who faced Saints and Leeds – with four forwards on the bench – and bring Sammut in the frame over the following fortnight. “Jarrod is available for selection, he’ll play a role in the next two or three weeks,” he said. Winger Dom Manfredi is unlikely to figure after minor surgery on his knee, but hasn’t been ruled out because he has an assessment tomorrow. Wigan yesterday reported the South Stand was close to being a sell-out and only a few hundred are available in the East Stand. The Warriors have made no secret of the fact they are aiming for a capacity crowd. Bookmakers Betfred, the current Super League partners, will be title sponsors of the World Club Challenge. Super League chief executive Robert Elstone said: “We are pleased to have secured Betfred as the title partner for this weekend’s game.